Michael Moore and Morgan Spurlock are considered to be the most popular documentarians around, with their blend of raw footage, statistics, experts, humor, and larger than life personalities of their hosts drawing critical and popular acclaim (as much as any documentaries get popular acclaim). Lee Hirsch’s Bully shows you don’t need any of those flashy devices to stir an emotional reaction. Rather than a socio-political deconstruction of the idea of ‘The Bully’, Hirsch uses an anecdotal approach to make real to the audience what America’s middle schoolers are currently dealing with. If you are a student, parent, or teacher, you are no doubt familiar with the bullying ‘epidemic’ currently facing America’s education system. Bully places us on the inside, following the lives of several middle school students and their families as they deal with being bullied. Most saddening are the cases of Tyler Long and Ty Smalley, victims of bullying who took their own lives. The film follows these children and their parents as they attempt to deal with the hell that has become their everyday lives. Most importantly, the film shows kids actually being bullied, pushed, poked, choked, and harassed. Consequently, any notion of ‘everyone gets picked on sometime’ or ‘boys will be boys’ will be completely shot by the end of the film. Being picked on is one thing, but the kids in the documentary are tormented every day of their lives, humiliated and alone, they have given up going to their parents, school administrators or police. Seeing the reactions of the parents and administrators to these bullied kids is probably the most heartbreaking aspect of the film. It helps, of course, that our protagonists are easily lovable when one is outside the Darwinistic constructs of small town school life. None of these kids are inherently antisocial, it’s more apt to say that they are just different enough to be easily separated from everyone else. This is one of the most poignant movies I have ever seen, and a great example of a film being Important. This is a film that needs to be seen by every parent, teacher, school administrator, and student. While I doubt the film will guilt bullies into changing, or suddenly free victims from their plight, all it would take in most of these situations is one other kid to be a friend. Hirsch has purposefully made this film as a call to action, to face the realities of what is already happening in our schools. The filmmakers do not offer any substantial solution, and rightly so. Bullyis the beginning of a conversation. It is far from the end of it. Bully opens today in Philly-area theaters. 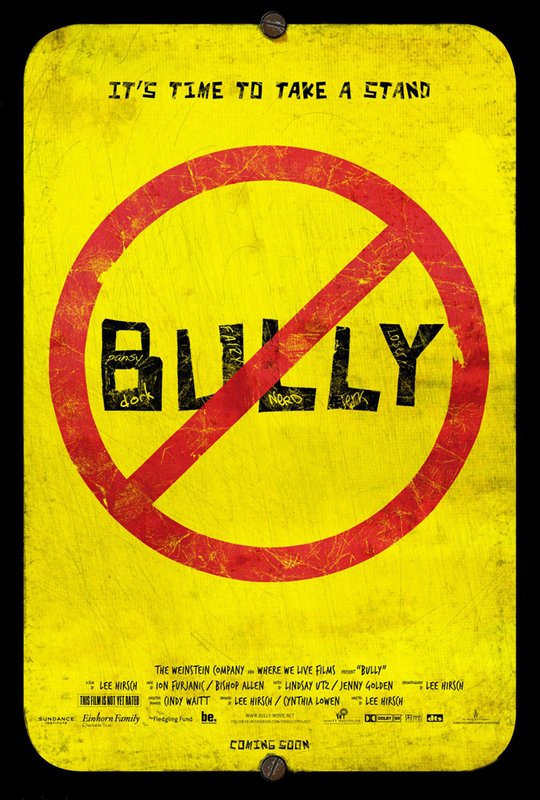 I thought BULLY was sloppily made (the blurry shots alone induce eyestrain in an attempt to provide a vérité pedigree) and by focusing solely on kids in rural environments, it will not reach its prospective (and desired) target audiences in urban schools or coastal suburban areas. Viewers outside the rural midwest and southwest will likely find themselves distracted by the more “hickish” trappings of the lives of those profiled and this distraction (even if not deserved) will cause an emotional distancing that could have been avoided by profiling the lives of the young and bulled in different parts of the U.S. While the filmmakers’ intention is surely earnest, their polemic is intrinsically flawed and thus rendered dismissible.